When optimal natural light is required, industrial sectional doors can be partially or fully glazed with full-vision panels. 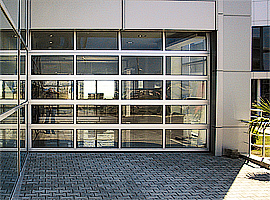 LOGEL full vision overhead doors are constructed from high quality materials and are incredibly durable. Glazing can be single or double. Alternative option for bringing natural light through industrial sectional doors are double-glazed oval or rectangular windows. Their number and positioning depends on the door dimensions and customer requirements. 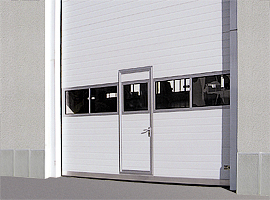 Standard industrial sectional doors are available in two colors RAL 9002 (gray-white) or RAL 9006 (silver gray). 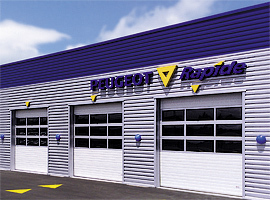 Upon request sectional door can be manufactured and delivered in any color from RAL palette. Each sectional door with a height of more than 2400 mm can have pass door of size 850 x 2100 mm. It can be located in either the center, left or right. Safety device in case of spring breakage. safety edge, stopping the sectional door operation when encountering an obstacle.